La cucina povera, or the cuisine of the poor, has become quite fashionable in recent years. Based on ‘humble’ ingredients (some of which have ironically become quite expensive) and simple cooking techniques, these traditional peasant dishes were born out of necessity. And yet they still appeal to us today, partly out of nostalgia for simpler times, partly because they’ve come to represent a kind of authenticity that seems to have been lost in modern life. But probably they just taste too good to give up, even when you can afford something ‘fancier’. 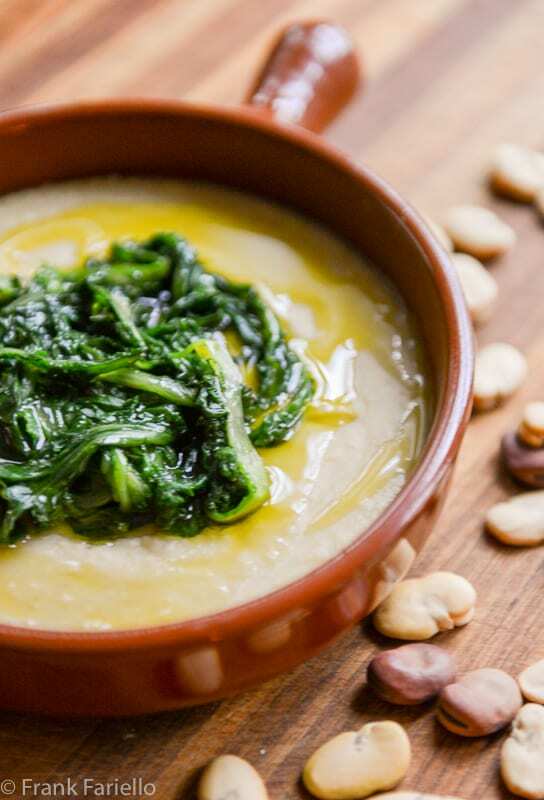 Fave e cicoria—Fava Bean Purée with Chicory—is a dish from my grandfather Lorenzo’s native Puglia. It epitomizes, for me at least, the whole cucina povera concept. It is made from two ingredients that were and still are dirt cheap. Or free, in fact, for some people I knew back in Rome, who still foraged for wild chicory, or cicoria selvatica, in the open fields around the city. But put these two unpretentious ingredients together and you get a taste experience to appeal to the most sophisticated of palates. Simmer about an hour or more, until the favas have become very tender. Stir frequently and top up with more water as needed to prevent the beans from drying out and scorching, but you do want to water to reduce, so that by the time the favas are tender, the water will mostly have evaporated. When the beans are tender, begin to mash them with the side of your wooden spoon, until the beans have formed a kind of ‘cream’. If you want a smoother texture, use an immersion blender or pass the favas through a food mill and return them to the pot. Add a good pour of olive oil to enrich the beans. Continue simmering, stirring all the time, until the beans have formed a purée thick enough that you can form a little ‘canal’ with a wooden spoon as you stir. The purée should have the texture of mashed potatoes. Taste and, if necessary, adjust for seasoning. Meanwhile, boil the chicory in well salted water until fully tender but still bright green, about 4-5 minutes. Drain. Place your fava bean purée in the bottom of individual plates. Place some of the boiled greens on top of the fava purée. Drizzle both greens and purée with a generous amount of the best, fruitiest olive oil you can find. The beauty of Fava Bean Purée with Chicory lies in the contrast between the bitterness of the greens with the mild nuttiness of the beans. The best way to eat them is to take a bit of the greens with your fork, twirling them as you would strands of spaghetti, and then dip the greens into the purée. This way you can make sure you get a bit of greens and a bit of bean in each bite. In the US, dried fava beans can be hard to find, but if you have access to a Latin market (or a supermarket with Latin products) the Goya brand carries them. Our local Whole Foods has them in their loose dried goods section. Of course, Italian markets catering to immigrant Italian-Americans—not the upscale ones, which tend to neglect southern Italian products—should have them also. And they’re readily available online as well. You want peeled fava beans if you can find them. If you find favas with their skins still on, you will need to peel them before cooking. The skin, while not entirely inedible, does not make for good eating. This is not difficult, since once soaked, the skins should slide off fairly easily, leaving a pod of two loosely attached halves—but it does require some patience, so sit down with your bowl of favas and listen to some music while you peel. And you really want good, fruity, extra virgin olive oil to given this dish the proper character. If you use any other kind of oil, even the lighter olive oils, will not do. And, of course, if you can find olive oil from Puglia, so much the better. There are a few variations on fave e cicoria, mostly to make the dish more refined or savory. One rather common variation is to add some aromatics to cook along with the fava beans. Garlic and/or onion as indicated here are probably most common. But you will find recipes calling for carrot and celery, too, as well as fresh herbs. Some recipes call for a bit of tomato for color or potato for creaminess. In addition, some folks add a little peperoncino to their fave e cicoria for heat, either by adding some to the beans or by dressing the final product with oil infused with chili at the end. Some recipes call for sautéing the chicory separately from the favas in padella style, with garlic and oil. Finally, there are different ways to serve Fava Bean Purée with Chicory. I like placing the chicory on top of the fava bean purée as shown here. But it’s also common to serve the fava purée and chicory side by side, in a kind of yin and yang presentation. When the beans are tender, begin to mash them with the side of your wooden spoon, until the beans have formed a kind of 'cream'. If you want a smoother texture, use an immersion blender or pass the favas through a food mill and return them to the pot. Add a good pour of olive oil to enrich the beans. Continue simmering, stirring all the time, until the beans have formed a purée thick enough that you can form a little 'canal' with a wooden spoon as you stir. The purée should have the texture of mashed potatoes. I learned to cook from Armida in Rome and Maria in Milano. Armida is from the Abruzzo region and Maria from Sardegna. For 25 years they treated and loved me like a son. They scolded and were aghast at some of the “messes” I made but I learned about La Mano Felice and now that Im backin the States they are with me every day in my kitchen. Your blog very much brings their memory alive. Thank You Frank. I love cicoria Frank. A great combination. I haven’t been well that’s why I haven’t come around. Today is the first day I started blogging again. We are having lots of rain here in Sicily, but no snow, at least not in our area. Just saw your post, Francesca. So sorry to hear you haven’t been feeling well. But happy to see you back in action! We both love fava beans. We usually buy them fresh and tender in early spring when the skin is soft, like in green beans and cook them with onion, olive oil, finely chopped fennel fronds and lemon, in the ladera fashion. Have you tried a similar recipe? The chicory in this dish must pair amazingly with the fava beans, we both almost started clapping when we read your recipe. Thank you so much for sharing this dear Frank! Adoro le fave con la cicoria, nella nostra famiglia sono considerate un comfort food e quando le porto in tavola è sempre una grande festa . Io abito in veneto e anche da me non è facile reperire le fave secche , per fortuna ho conosciuto un’azienda siciliana che oltre all’olio extra vergine di oliva produce anche ottimi legumi . un saluto, Daniela. Sei proprio fortunata, Daniela. Grazie per il commento! I’m wondering about making a thick soup, almost polenta-like consistency, with fava/ceci flour in place of the mashed, pureed favas. It also seems rapine could stand int for cicoria if the latter are unavailable. What do you think. Sounds great to me. If you do try it, let us know how it comes out. My local supermarket, independently owned by an Italian family, has dried fave. Each Sunday I prepare a pot of soup for the week and your grandfather’s recipe is on the menu for the coming week. Fantastic. Hope you like it. I’m not sure I’ve seen chickory greens before. I’ll have to keep my eyes peeled. I have a feeling, though, that I could probably make this with another hearty green. And it’s turning so cold (finally) in Chicago now! I could go for a hot soup! Chicory is worth seeking out. It’s one of my favorite greens as I practically grew up on it (and escarole). But in the pinch, another hearty green like dandelions as suggested by Jim below, would do just fine. I am cooking favas as I write this. Around here the only dried favas I have found do require peeling after the long soak. I was at a farmers market today and found fresh dandelion greens that I think (hope) will go well with the favas. It has been years since I last had dried favas, but they somewhat remind me of the flavor of chestnuts. Looking forward to having “fave e dandelion” along with some fresh made sweet Italian sausage for dinner! Thanks for love you put into your blog. You inspire me! Thanks so much for your comment, Jim! And for your readership. I hope you enjoy the favas—and I think that dandelions would do just fine here. Sadly, my “fave e dandelion” was a total flop. Nothing negative or critical about your recipe though. Unfortunately, I think that my favas must have been harvested back around the time the Basilica San Nicola was built. After an overnight soak, then peeling, and then 12 hours of simmering I finally gave up. The favas were still hard as rocks! To the rescue came a can of cannellini beans … dinner was then dandelion e fagioli and the favas went in the trash. I will need to find a better source for favas as I had so much looked forward to that dish. Sorry to hear it, Jim. I think the problem is that there’s not much call for dried favas these days, so the ones you are likely to find in the average store have been sitting on the shelf for a long time… You can find peeled dried favas online—that might be a better bet. And I do like your idea of using the cannellini beans. Not quite the same taste but you’re definitely in the ball park. comprendere la tua delusione, aver vissuto a Roma e non trovare i cibi che vorresti…Qui a Trieste non trovo la mentuccia romana e nemmeno i carciofi romaneschi, eppure siamo in Italia, consolati……Questa tua ricetta è molto interessante e la foto mette appetito al primo sguardo, questo è cibo veramente confortante, mangerei ogni sera una zuppa diversa ! Comunque, grazie per il gentile commento, Chiara. Hai ragione, questo è un vero e proprio “comfort food”. This sounds amazing. Perfect fall dish! Frank – when I lived near Boston, I would go into the North End and buy bags of dried fava beans. I didn’t know what to do with them, so I ate them. They were a little salty and extremely crunchy, but somehow satisfying. Now I’m kicking myself for not looking for recipes like your grandfather Lorenzo’s. I guess I will have to buy some fava beans online. Love anything with dried legumes/pulses. I’ve used fresh fava beans, but I don’t believe I’ve ever used the dry. They’re not easy to find, at least in the supermarkets where I live (but I know they’re available in specialty grocery stores). This is a good dish — great way to use chicory, too. Thanks! You’re welcome, John. Definitely worth a try! I forgot to mention in the original post that they are readily available online as well.Bob’s Red Mills, among others, sell them. I bought mine loose at my local “Whole Paycheck”. Thank you Frank for introducing me to dried favs beans. I always buy the fresh fava beans in the spring at the farmers market and enjoy them immensely . This dish is my kind of meal. The beauty of dried favas is, you can enjoy them any time of year, just like other legumes. Of course, the taste isn’t quite the same but it’s surely delicious and quite unique. It has a nuttiness you won’t find in other beans.